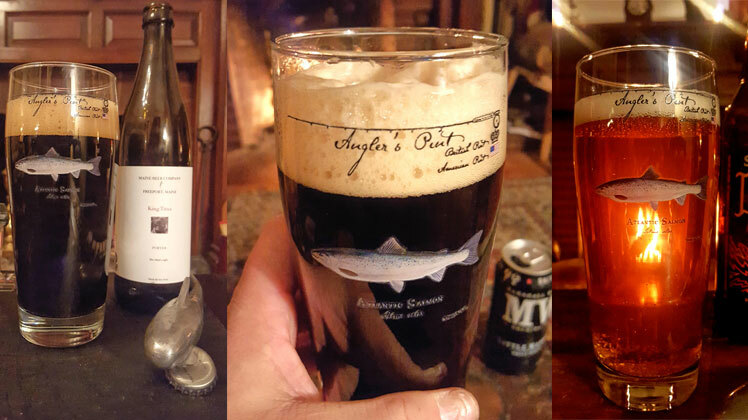 Tall tales of a day fishing are often accompanied by fine brews. The Angler's Pint will insure the tallest tales will be told while sipping your favorite beverage from these 21.5 ounce glasses featuring beautiful full-color scientific illustrations by award-winning Maine artist (and angler!) Karen Talbot. The White Marlin Angler's Pint was released in March 2019, and is the fourth Angler's Pint in the offshore or pelagic series! 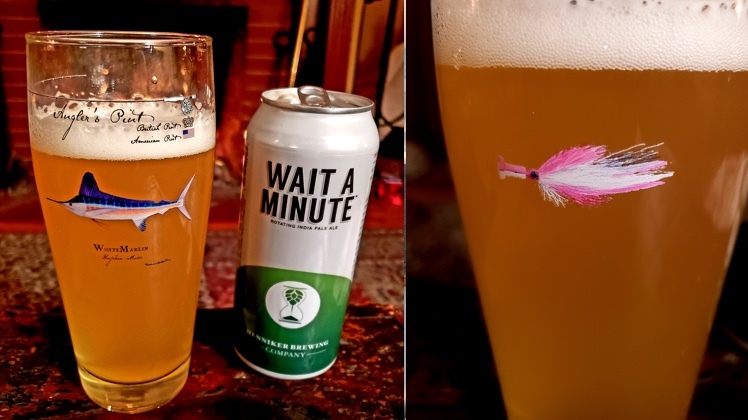 Like the other saltwater Angler's Pints, the White Marlin Angler's Pint features a saltwater rod and reel, as well as an appropriate fly pattern on the back of the glass. At present, the White Marlin Angler's Pint is only available from the Karen Talbot Art online store and in the Karen Talbot Art Gallery in Rockland, Maine. Quantities are very limited. Subscribe for updates on when new Angler's Pints will be released at the bottom of this page. 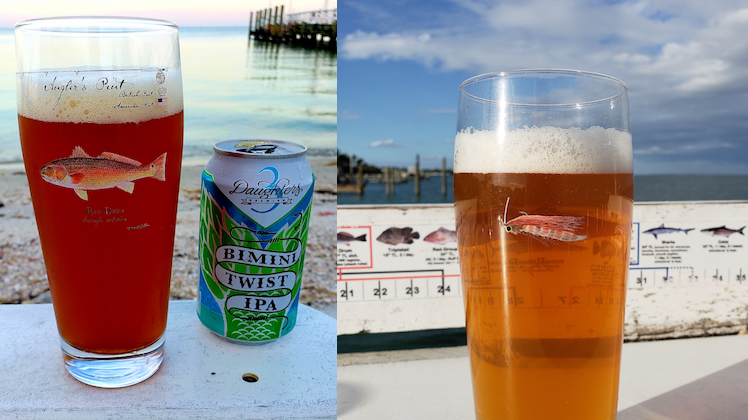 The Bonefish Angler's Pint was released in early 2019, and is the perfect compliment to the Tarpon and Red Drum Angler's Pints! Like the other saltwater Angler's Pints, the Bonefish Angler's Pint features a saltwater rod and reel, as well as an appropriate fly pattern on the back of the glass. At present, the Bonefish Angler's Pint is only available from the Karen Talbot Art online store and in the Karen Talbot Art Gallery in Rockland, Maine. Quantities are very limited. Subscribe for updates on when new Angler's Pints will be released at the bottom of this page. The Red Drum (Redfish) Angler's Pint was released in early 2019, and is the perfect compliment to the Bonefish and Tarpon Angler's Pints! Like the other saltwater Angler's Pints, the Redfish Angler's Pint features a saltwater rod and reel, as well as an appropriate fly pattern on the back of the glass. At present, the Red Drum Angler's Pint is only available from the Karen Talbot Art online store and in the Karen Talbot Art Gallery in Rockland, Maine. Quantities are very limited. Subscribe for updates on when new Angler's Pints will be released at the bottom of this page. The Tarpon Angler's Pint was released in early 2019, and is the perfect compliment to the Bonefish and Redfish Angler's Pints! 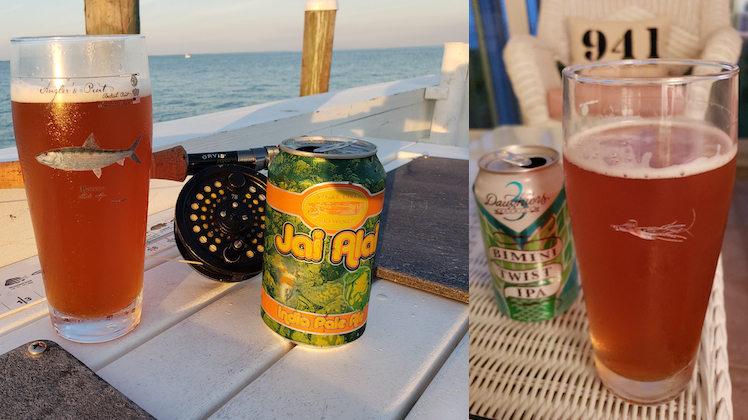 Like the other saltwater Angler's Pints, the Tarpon Angler's Pint features a saltwater rod and reel, as well as an appropriate fly pattern on the back of the glass. At present, the Tarpon Angler's Pint is only available from the Karen Talbot Art online store and in the Karen Talbot Art Gallery in Rockland, Maine. Quantities are very limited. Subscribe for updates on when new Angler's Pints will be released at the bottom of this page. The Anniversary Angler's Pint was released in 2018 to celebrate the second year since the Angler's Pint hit the big time! This Anniversay Angler's Pint features a brand new brook trout illustration on one side and a special anniversary design on the other. Each of these limited edition glasses is signed and numbered! 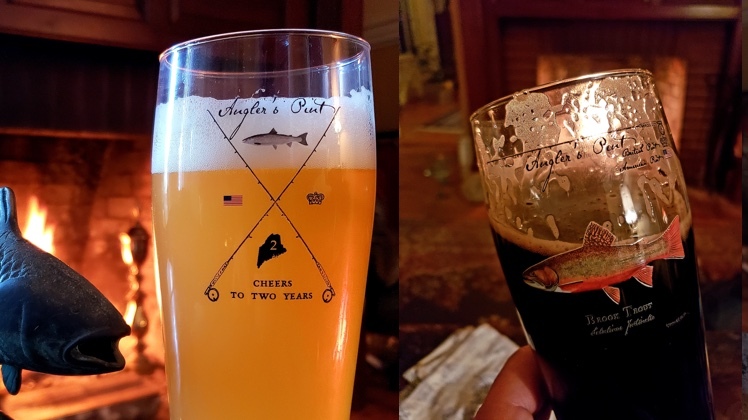 At present, the Anniversary Angler's Pint is only available from the Karen Talbot Art online store and in the Karen Talbot Art Gallery in Rockland, Maine. Quantities are very limited. Subscribe for updates on when new Angler's Pints will be released at the bottom of this page. The Mahi Mahi Angler's Pint was released in time for summer 2018 and is the perfect compliment to the Yellowfin and Bluefin Tuna Angler's Pints. The saltwater Angler's Pints differ from the salmonid Angler's Pints insofar as they feature a saltwater rod and reel, as well as an appropriate fly pattern on the back of the glass. At present, the Mahi Mahi Angler's Pint is only available from the Karen Talbot Art online store and in the Karen Talbot Art Gallery in Rockland, Maine. Quantities are very limited. Subscribe for updates on when new Angler's Pints will be released at the bottom of this page. The American Shad Angler's Pint was released in time for the spring 2018 shad runs. The artwork was created for a project featuring Maine's native sea run fishes that was produced by Maine Sea Grant in partnership with NOAA Fisheries Service and The Nature Conservancy in Maine with funding from NOAA's Habitat Blueprint for the Penobscot River. At present, the American Shad Angler's Pint is only available from the Karen Talbot Art online store and in the Karen Talbot Art Gallery in Rockland, Maine. Quantities are very limited. Subscribe for updates on when new Angler's Pints will be released at the bottom of this page. The Atlantic Salmon Angler's Pint is the second salmon Angler's Pint (the first was the limited release Chinook Salmon Angler's Pint), and it's here in time for Christmas 2017. 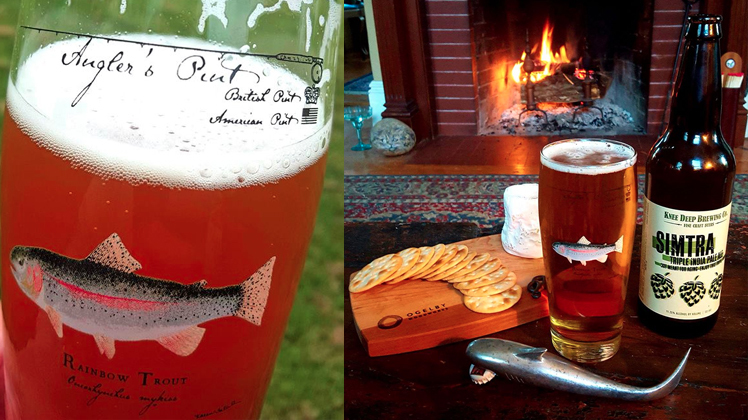 At present, the Atlantic Salmon Angler's Pint is only available from the Karen Talbot Art online store and in the Karen Talbot Art Gallery in Rockland, Maine. Quantities are very limited. Subscribe for updates on when new Angler's Pints will be released at the bottom of this page. 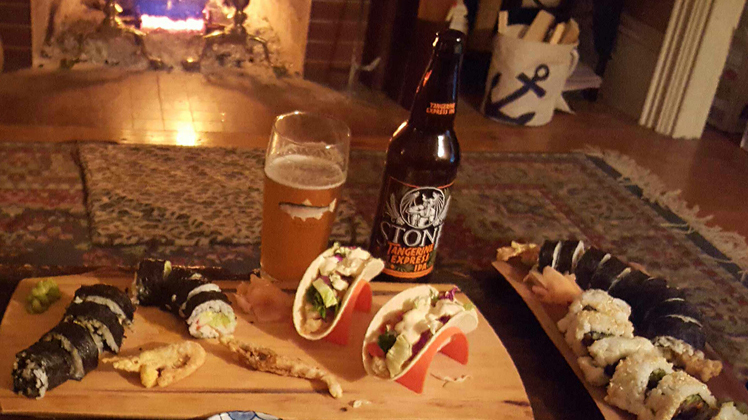 The Yellowfin Tuna Angler's Pint is the perfect companion to the Bluefin Tuna Angler's Pint. The saltwater Angler's Pints differ from the salmonid Angler's Pints insofar as they feature a saltwater rod and reel, as well as an appropriate fly pattern on the back of the glass. 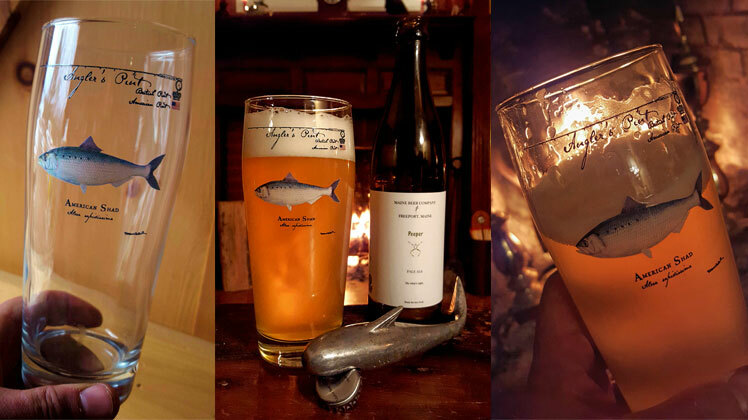 At present, the Yellowfin Trout Angler's Pint is only available from the Karen Talbot Art online store and in the Karen Talbot Art Gallery in Rockland, Maine. Quantities are very limited. Subscribe for updates on when new Angler's Pints will be released at the bottom of this page. 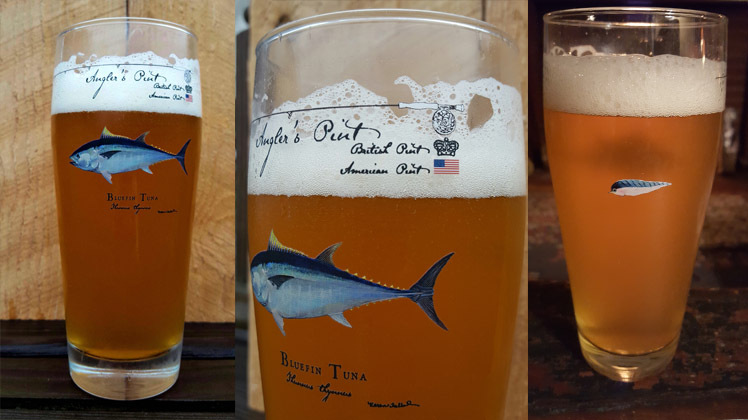 The Bluefin Tuna Angler's Pint is the first glass in a new saltwater line of Angler's Pints. 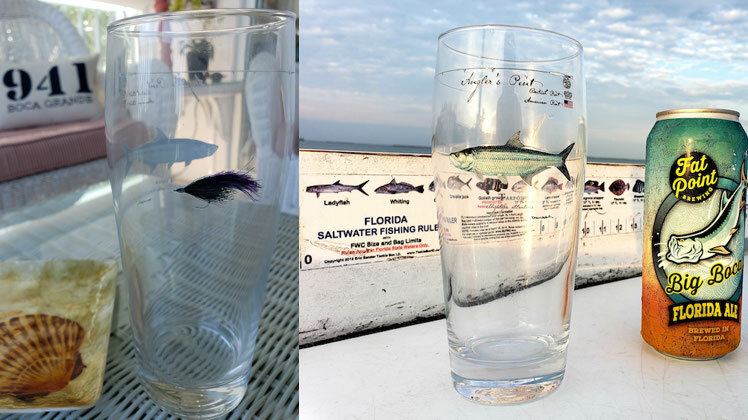 These saltwater Angler's Pints differ from the trout Angler's Pints insofar as they feature a saltwater rod and reel, as well as an appropriate fly pattern on the back of the glass. 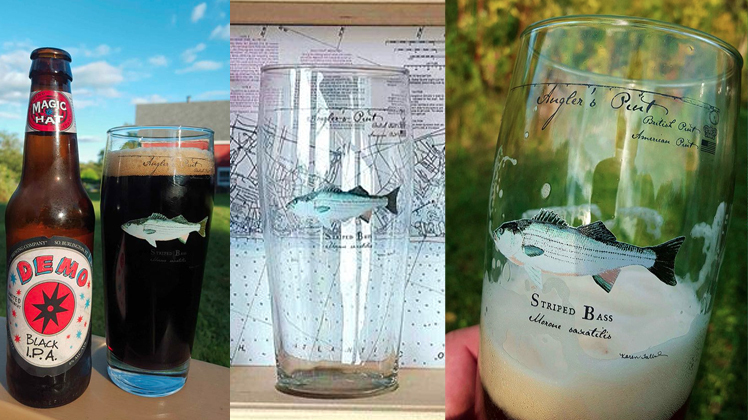 At present, the Bluefin Trout Angler's Pint is only available from the Karen Talbot Art online store and in the Karen Talbot Art Gallery in Rockland, Maine. Quantities are very limited. Subscribe for updates on when new Angler's Pints will be released at the bottom of this page. The Chinook Salmon Angler's Pint is a limited edition Angler’s Pint created to celebrate the North Carolina premiere of the internationally acclaimed environmental documentary, The Memory of Fish. These limited edition Chinook Salmon Angler's Pints are co-branded with the name of the event and event sponors, and they are only available in the Karen Talbot Art online store and in the Karen Talbot Art Gallery in Rockland, Maine. Subscribe for updates on when new Angler's Pints will be released at the bottom of this page. In March 2017, Karen revealed version 2.0 of the Angler's Pint. The new Angler's Pints feature a full color American Flag and a far more detailed reproduction of the featured fishes. 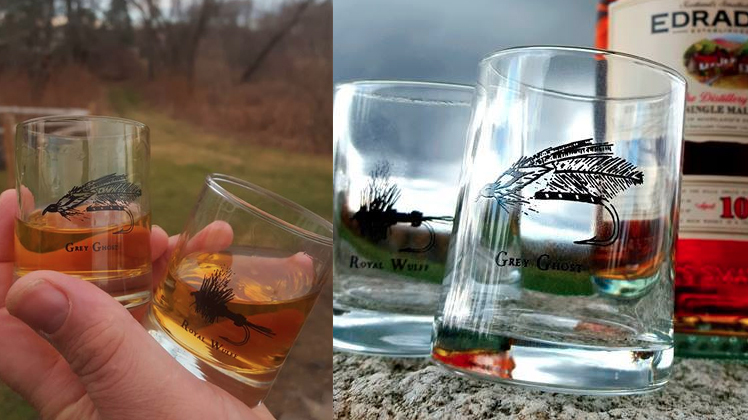 The new glassware will be available through Orvis as current inventory is phased out. The new Angler's Pints are also available in limited quantities at Karen Talbot Art Online and in the Karen Talbot Art Gallery in Rockland, Maine. Wholesale pricing is available for conservation groups, angling clubs, fly fishing shops, lodges, restaurants, cafes, bars, or other specialty retailers. Subscribe for updates at the bottom of this page. 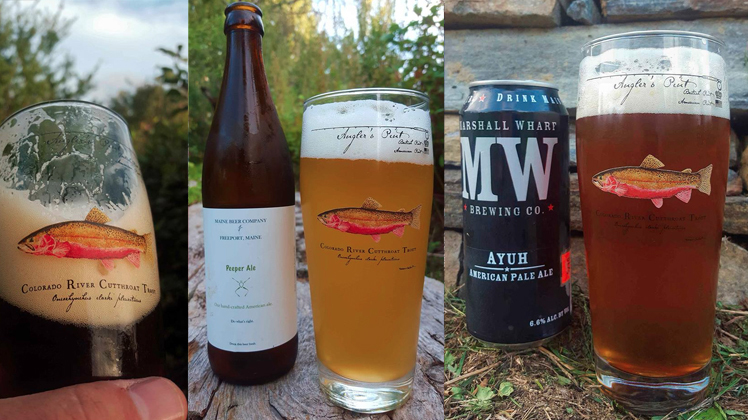 The Cutthroat Trout Angler's Pint Kickstarter campaign successfully wrapped in July 2016. 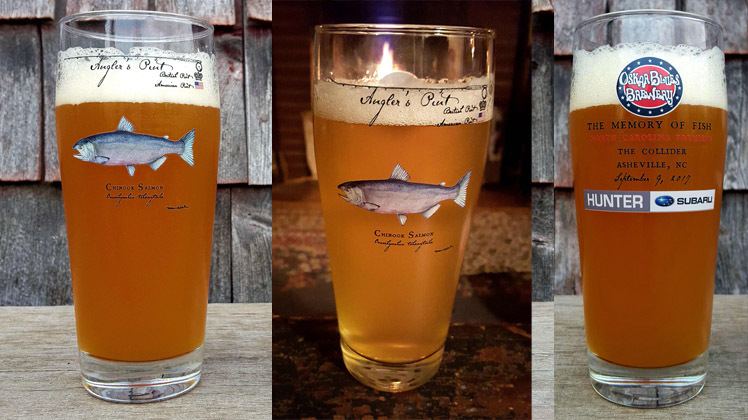 Cutthroat Trout Angler's Pint are available through Orvis, at Karen Talbot Art Online and in the Karen Talbot Art Gallery in Rockland, Maine. Wholesale pricing is available for conservation groups, angling clubs, fly fishing shops, lodges, restaurants, cafes, bars, or other specialty retailers. Subscribe for updates at the bottom of this page. The successful Rainbow Trout Angler's Pint Kickstarter campaign wrapped up on March 25, 2016, and the Rainbow Trout Angler's Pint is available now through Orvis, online at the Karen Talbot Art Online Store and in the Karen Talbot Art Gallery in Rockland, Maine. Wholesale pricing is available for conservation groups, angling clubs, fly fishing shops, lodges, restaurants, cafes, bars, or other specialty retailers. Subscribe for updates on when new Angler's Pints will be released at the bottom of this page. The Brown Trout Angler's Pint successful Kickstarter campaign wrapped in November 2015, and Brown Trout Angler's Pints are now available through Orvis, online at the Karen Talbot Art Online Store and in the Karen Talbot Art Gallery in Rockland, Maine. . Wholesale pricing is available for conservation groups, angling clubs, fly fishing shops, lodges, restaurants, cafes, bars, or other specialty retailers. Subscribe for updates on when new Angler's Pints will be released at the bottom of this page. 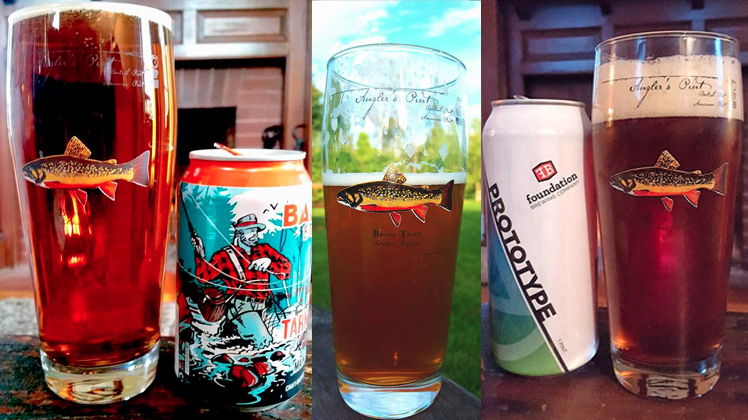 With the resounding success of the first Angler's Pint Kickstarter campaign in the spring of 2015, the Brook Trout Angler's Pint was born. 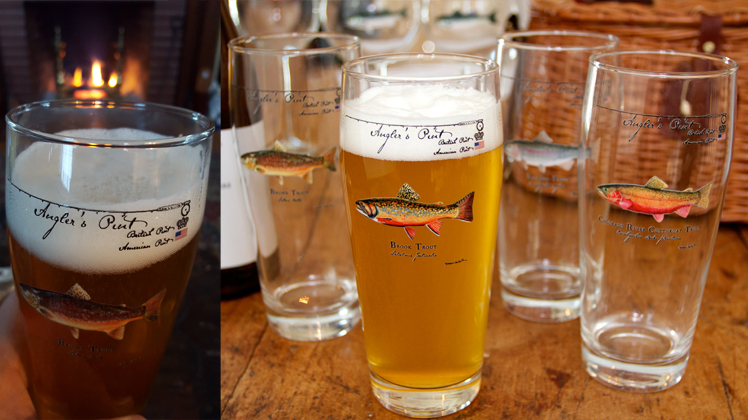 Brook Trout Angler's Pints are now available through Orvis, online at the Karen Talbot Art Online Store and in the Karen Talbot Art Gallery in Rockland, Maine. Wholesale pricing is available for conservation groups, angling clubs, fly fishing shops, lodges, restaurants, cafes, bars, or other specialty retailers. Subscribe for updates on when new Angler's Pints will be released at the bottom of this page. 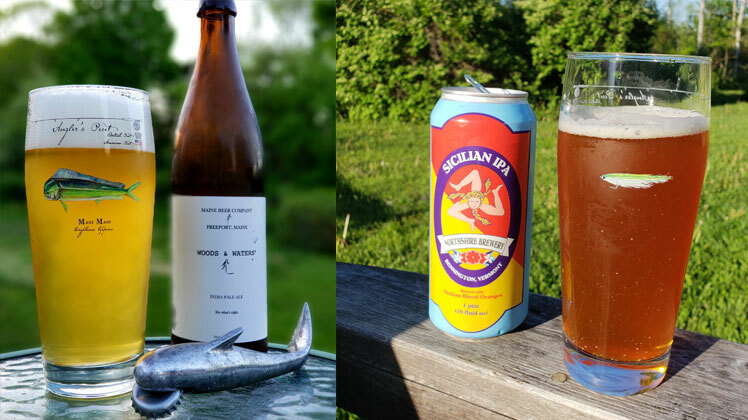 In addition to the Brook Trout Angler's Pint, the first Angler's Pint Kickstarter campaign raised enough capital to launch the Striped Bass Angler's Pint concurrent with the Brook Trout Angler's Pint(s). 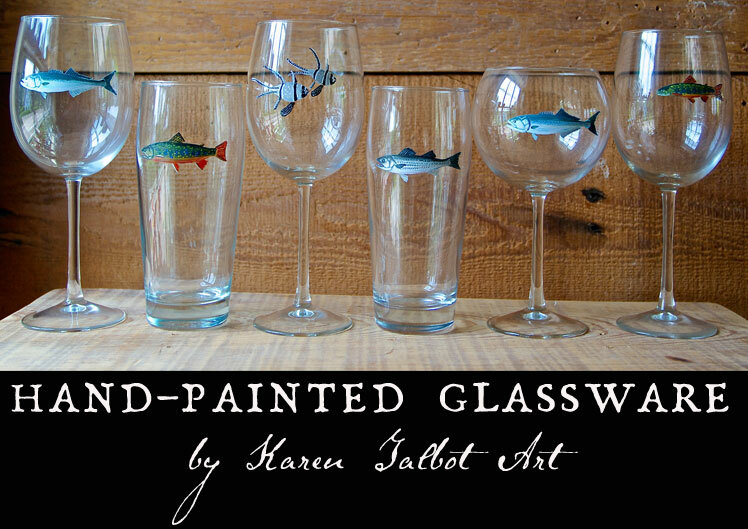 Striped Bass Angler's Pints are available in the Karen Talbot Art online store and in the Karen Talbot Art Gallery in Rockland, Maine. Wholesale pricing is available for conservation groups, angling clubs, fly fishing shops, lodges, restaurants, cafes, bars, or other specialty retailers. Subscribe for updates on when new Angler's Pints will be released at the bottom of this page. The Classic Fly Jigger is a generous 3-ounce glass featuring an illustration of a classic fly. The Grey Ghost Classic Fly Jigger and the Royal Wulff Classic Fly Jigger are available online at the Karen Talbot Art Online Store and in the Karen Talbot Art Gallery in Rockland, Maine. The suggested retail price is $6 per glass. Wholesale pricing is available for conservation groups, angling clubs, fly fishing shops, lodges, restaurants, cafes, bars, or other specialty retailers. Subscribe for updates on when new Classic Fly Jiggers will be released at the bottom of this page. 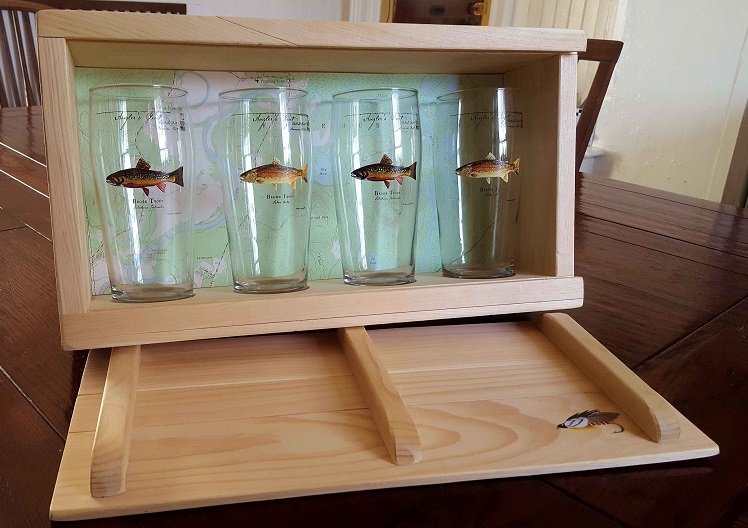 The Angler's Pint Presentation Box is the perfect way to either give or collect all four trout Angler's Pints. These handcrafted, Maine-made wood boxes can be customized with your choice of topogrpahical map background featuring your favorite fishing waters, as well as your choice of handpainted fly on the lid. The box doubles as great storage for fly tying materials. They are available at www.KarenTalbotArtOnline.com. 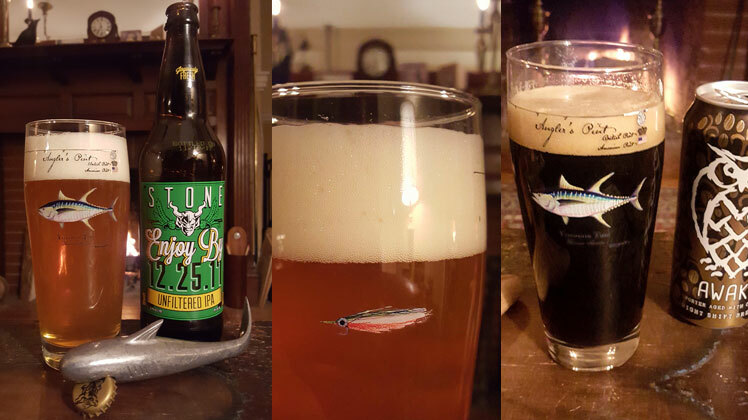 The Angler's Pint blog contains Karen's musings at the intersection of beer & angling. 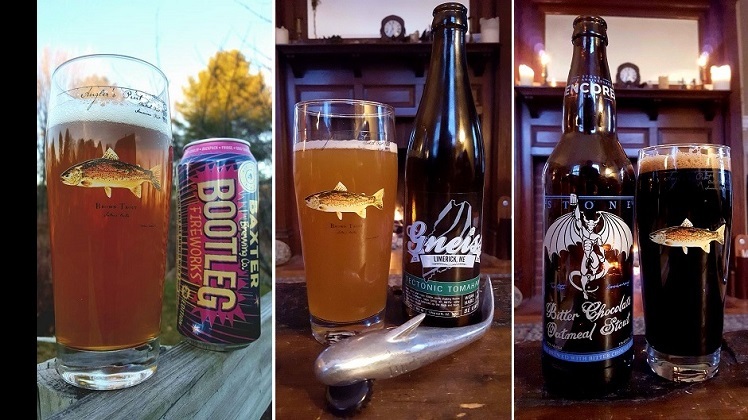 Recipes (using beer, of course), conservation notes, Angler's Pint stories, tips & tricks for caring for your Angler's Pint, and more are all fair game at the blog. Check it out now by clicking here. Karen Talbot is an award-winning scientific illustrator and fine artist best known for her depiction of fishes. As an avid fly angler, she has firsthand experience with many of her subjects. 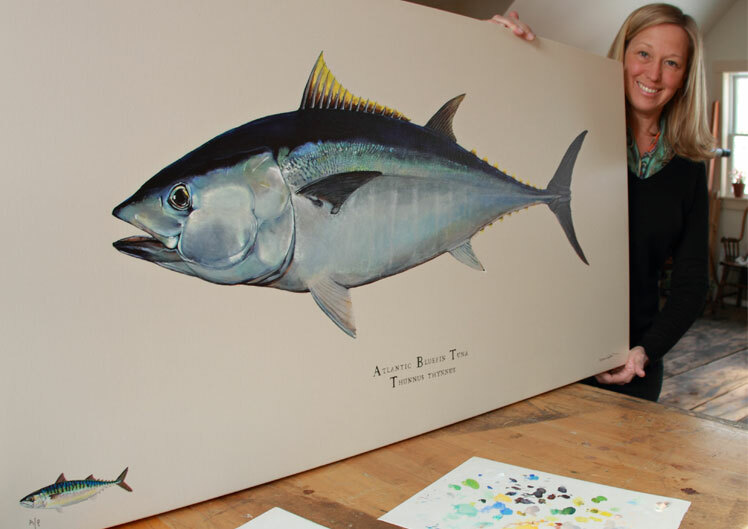 The tagline of Karen Talbot Art is "Conservation through Appreciation," and Karen believes art, like angling, can bring much needed attention to important conservation issues. These heavy, durable glasses feature a stylish German design and are 7.25 inches tall with a 3-inch diameter rim and a 2.375 diameter base. The full-color artwork on the Angler's Pints uses ten different inks and is then permentantly fired onto the glass. A British pint is 20 imperial fluid ounces (568 ml), while a standard US pint is just 16 US fluid ounces (473 ml). The Angler's Pint is 21.5 ounces (636 ml). Angler's Pints are produced right here in the US by a company with more than 20 years experience producing quality full-color glassware. Angler's Pints are designed to be used, not sit on a shelf. Angler's Pints are not only durable, but the full-color artwork is dishwasher safe! After a lot of research, planning and negotiation, Angler's Pints are priced at a resonable price point for both retail and wholesale.